Listen to the Author on Radio ~ Spiritual Stress Management Articles: Here are unique offerings, creative spiritual healing methods (what I call "spherical strategies") to help you feel your beautiful Soul awakening in this present moment. Enjoy reading these stories and articles as much as I have in preparing them for you. Article: "Meditation is NOT What You Think!" I cut my spiritual teeth on Joseph Campbell when I met him at age seventeen. My yoga teacher brought me to an AHP conference (Association for Humanistic Psychology) back in the early '70s, saying, "I want you to learn from the greatest minds of our time." Dr. Jean Houston gave the powerful keynote speech, and I was thrilled to meet her later that weekend since my teacher was a close student of hers. "Learn from Campbell -- he's one of the best," my teacher said. We split up, and I walked down the huge corridor of the hotel alone (I admit a bit nervous) to a fairly large room with a big screen. After spending an entire day watching beautiful slide after slide, listening to this incredible man speak so eloquently and fluidly, I knew I was in the company of greatness. At the end of that seminar, Mythology Symbols and the Psyche, I gathered up some courage and approached him, waiting patiently in line behind a few other enthusiasts. He was so kind and generous with his time. I remember him an older statesman of sorts, standing in his trademark stance sliding his hands down into his tweed suit jacket pockets speaking compassionately. When Professor Campbell spoke to you, he gave you his full presence; he wasn’t speaking down at you, he was with you—in your sphere. Well Joe, thanks; I did take your advice, and I am living proof that it works! Quite frankly, I “did a 360” with my life. I turned myself around three hundred and sixty degrees to an all-encompassing, spherical view. If each one of us would follow their bliss, taking the hero’s journey in their own inimitable way, then individually, as well as collectively we will raise consciousness into a new Earth. 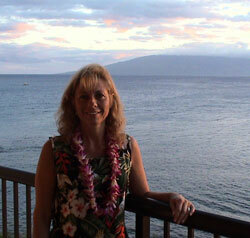 Reverend Dr. Nancy Ash on beautiful Maui with the tranquil Island of Lanai in the background. I trust you've enjoyed reading a few of my spiritual stress management articles chock-full of powerful spiritual healing methods for awakening your Soul's purpose. Re-member, Spiritual Development means that you evolve your personality from SOUL's desire to do so in form -- which is your physical body during this lifetime. So, in essence, this conscious growth is the unfolding true nature of yourself...which is divine. "Doing a 360" (three-sixty) is a life-changing process to WAKE UP and see a healing vision, a COMPLETE (spherical) VIEW from three hundred and sixty degrees. Thanks for visiting today. May all be splendid for you and family. I'm the creator and managing editor of "Doing a 360" which is also a phrase coined through me with divine inspiration in 2006. Eventually it all got published in my first book (2012) called, Doing a 360: Turning Your Life Around to Follow Soul's Purpose. Browse around this sacred circle for more spiritual stress management articles to explain more about what that means. If you feel inspired send me a prayer request.